Title: Moment in the Brain. Description: Microglia and neurons cells in the hippocampus. Image was captured using a confocal microscope. 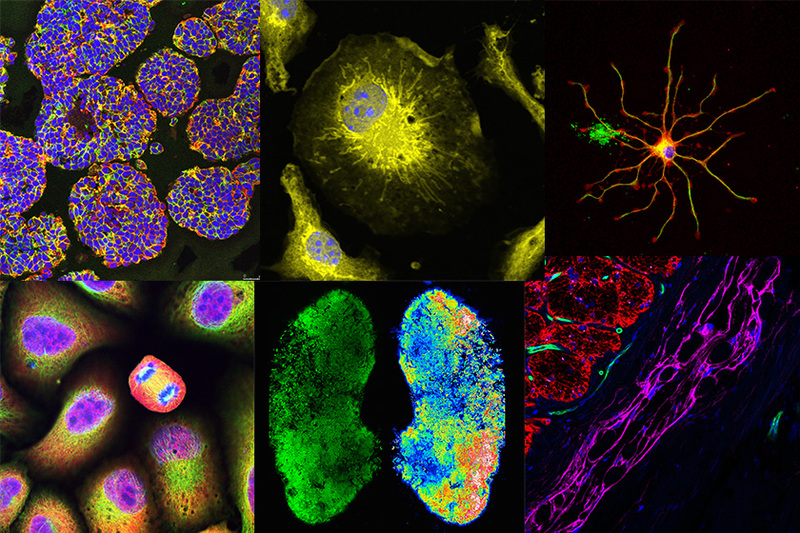 The varying colours reflect the cells at different position within the brain. 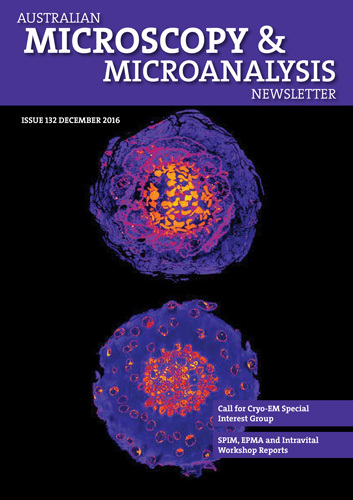 Title: Microfluidic in vitro model for synaptically connected human neurons. Description: Induced pluripotent stem cell derived human neurons were cultured and differentiated for 24 days in a microfluidic chamber, where the two panels containing the neuronal cell bodies were separated by 150 𝛍m long micro-channels in the centre. These micro-channels only allow the neuronal axons to pass through them and synaptically connect the human neuronal networks on both sides of the micro-channels. 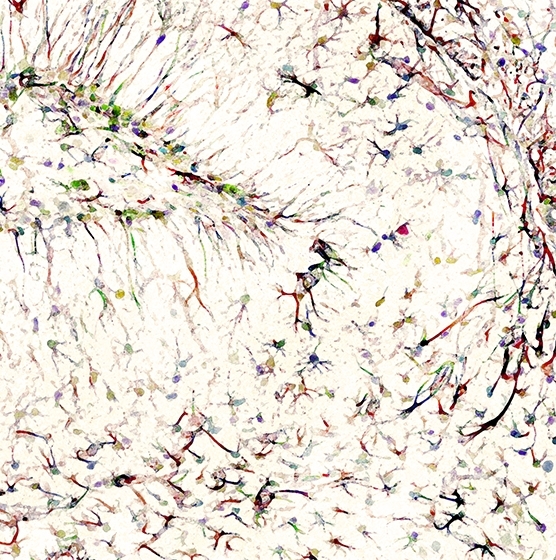 This is a maximum intensity projection of a stitched tile image taken with a 20x objective (Z-stack – 39 slices, 39.9 𝛍m and 21 tiles (2.04 mm x 892.84 𝛍m). 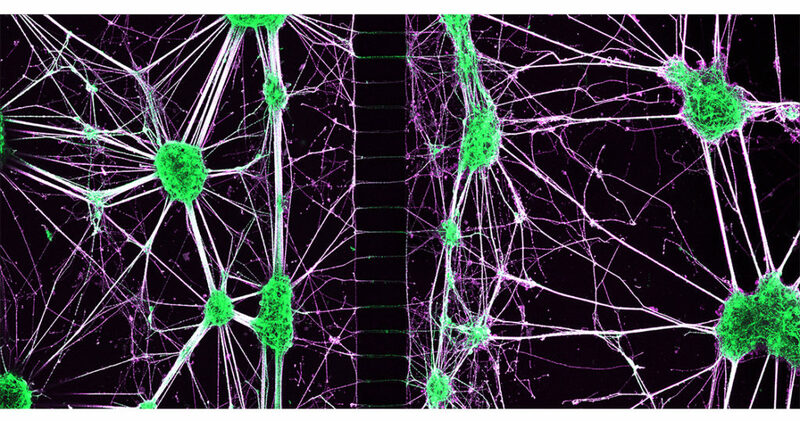 In the image the neurons are stained with MAP2 (green) a mature neuron marker and tubulin (violet). Title: A pH-activated antibody label to track receptor internalisation and trafficking. Description: Hypothesis: cellular receptor CDCP1 is internalised by a monoclonal antibody (mAb) causing trafficking to lysosomes for degradation. Live cell imaging with spinning disc confocal (SDC) microscopy allowed the speed and resolution to track the internalisation of GFP-tagged CDCP1 and trafficking of the mAb-CDCP1 complex. A pH-activated fluorescent dye labelled the mAb for visualization of internalisation and trafficking of the complex to low pH endosomes & lysosomes for degradation.